The musical alphabet consists of the note-names A through G. On the guitar, the open sixth string is the note E. The distance from E to F is a half-step, one fret on the guitar, so F falls on the first fret. 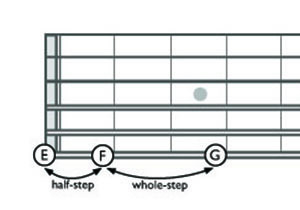 F to G, G to A and A to B are all whole-steps, two frets on the guitar. Below is the placement of all the natural notes on the sixth string. Notice that B to C is also a half-step, frets seven and eight. 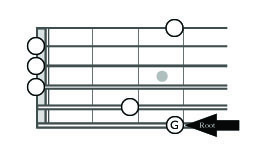 You can also see that at the twelfth fret, often marked with double dots, the note E repeats, but now one octave higher. 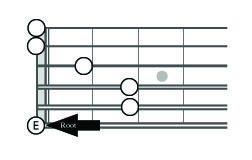 The notes on the sixth string also correspond to the root-notes of common open chords such as E major and G major. 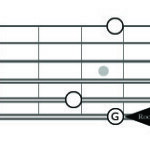 The A at the fifth fret is actually the exact same note of the open fifth string. This is why guitarists often use the fifth fret for relative tuning. Your facebook post said “Tips and tricks for learning and memorizing the ‪#‎guitar‬ notes along the sixth string, E. https://ow.ly/RE3Iv” but I don’t see anything I’d call tips or tricks here. ??? Hi I’m there until I can play!! !